I often get the question, “What is the difference between Medicare Advantage vs Medigap plans?”. So few people understand the difference between Medicare Advantage versus Medigap that I even created a class that helps people understand. If you want to take this free class, just go to http://MedicareQuick.com/Class, and watch the 20 minute video called “Making Medicare Decisions”. 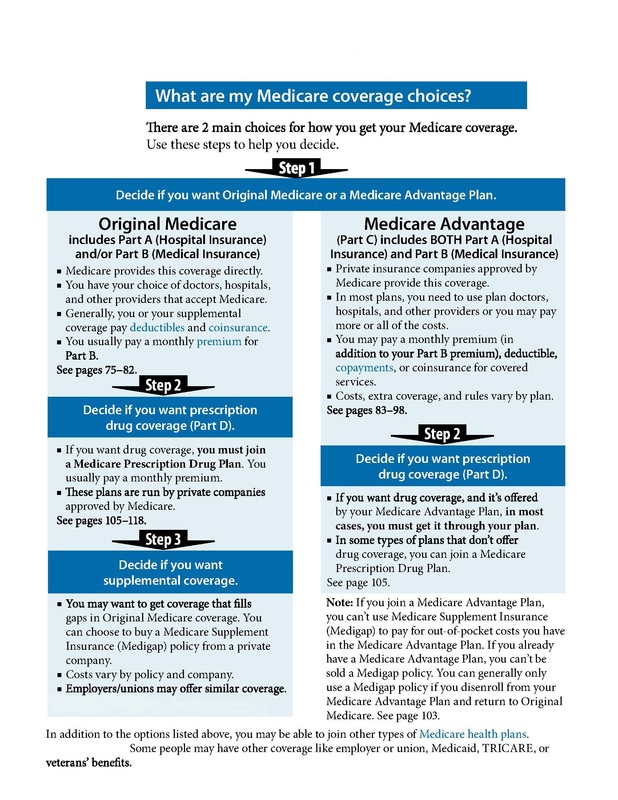 It will help you understand the difference between Medicare Advantage and Medigap. Before we can understand the differences between Medicare Advantage vs Medigap, we need to understand what original Medicare covers, because it doesn't cover everything. Medicare Part A covers hospitalization and inpatient care. You pay a deductible for the first 60 days while staying in a hospital. This is per occurrence, not per year, so you can wind up paying that Part A deductible more than once during the year. In 2019 the Medicare Part A deductible is $1,364. 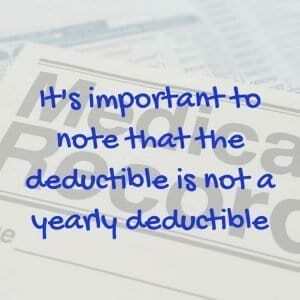 It's important to note that the deductible is not a yearly deductible. The deductible is per “benefit period”. After you've been in the hospital for 60 days, you'll start paying a co-pay. In 2019 this copay is $341 coinsurance per day of each benefit period. You'll use Lifetime Reserve days while staying in a hospital on days 91 through day 150. When you're using lifetime reserve days you have a copay also. In 2019 the lifetime reserve day copay is $682 per day. Once you use these days, they're gone forever. Once you have been in the hospital for over 150 days and have used up your lifetime reserve days, you pay all costs. This means that you could potentially have an unlimited liability! Unlimited liability is just plain unacceptable to me, so that's why I personally don't really care which type of plan you choose, Medicare Advantage or Medicare Supplement insurance. I just think that you should choose whichever is best for you, but I don't believe that you should just have original Medicare, with nothing else. Of course, there are exceptions in the state of California. If you have Medi-Cal, and it pays 100% of all your costs, then that would be the exception. Before we discuss skilled nursing care, I want to make sure that you understand that skilled nursing is NOT long-term care. Long-term care is for activities of daily living. Skilled nursing care is for medical issues. Let's say, for example, you fall and break your hip. You're admitted to the hospital as an inpatient for a few days. After 3-4 days you're released from the hospital but you still need additional care. In order for Medicare to cover your skilled nursing facility, you need to have been in the hospital as an inpatient for at least three days. Sometimes you can be admitted to the hospital and actually stay overnight, but you're an outpatient according to the hospital. This is because if you are not in the hospital as an inpatient for a minimum of three days, Medicare will not pay for any of your skilled nursing facility. But, if you are eligible, Medicare will pay for the first 20 days, and then for days 21 through 100, you're responsible for a co-pay. In 2019 the amount is $170.50 coinsurance per day of each benefit period. Then after you've been in the skilled nursing facility for 100 days, Medicare will not pay anything and you're responsible for all costs. Let's now take a look at Medicare Part B. Medicare Part B is the part of Medicare that covers your doctors, outpatient services, tests, and supplies. 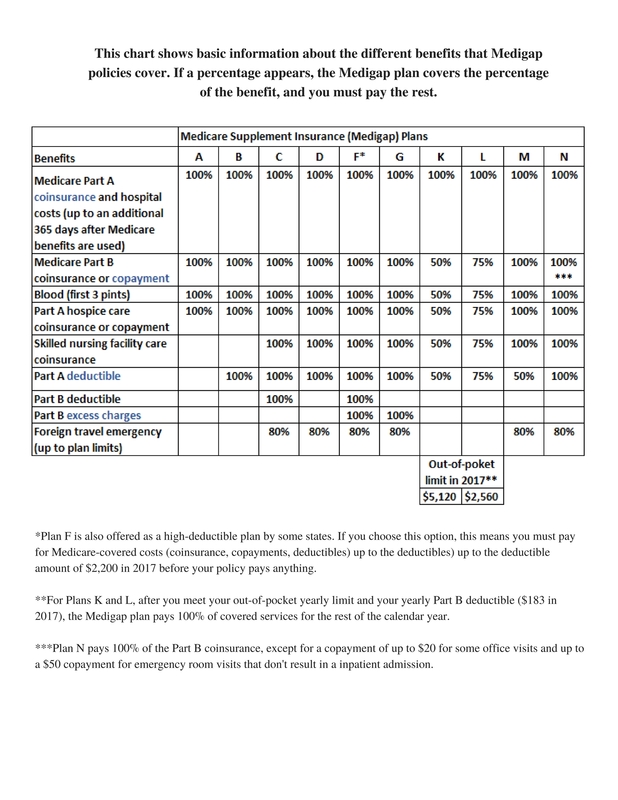 In addition to the monthly premium (most people pay $135.50 per month in 2019) that you must pay for Part B, Medicare Part B has an annual deductible. This is different from the Medicare part A deductible where you can pay more than once throughout the year. 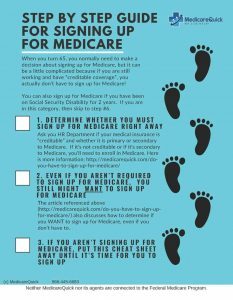 For Part B you only pay it one time a year, and then after you pay it, Medicare will cover 80% of the approved amount for your medical expenses and you'll pay 20% of the approved amount plus 100% of excess doctor charges. In 2019 the Part B deductible is $185. What's an excess doctor charge? 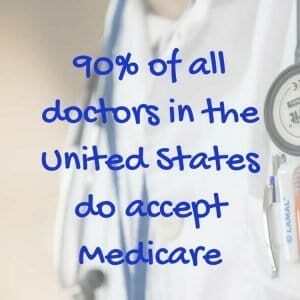 Well, about 90% of all doctors in the United States do accept Medicare, but they're not required to accept Medicare assignment. According to KFF.org, there are 968,743 doctors in the USA in 2018. I have heard stories of doctors not accepting Medicare in high-income areas such as New York and Alaska, but where I live in San Diego, CA, virtually all doctors accept original Medicare. If a doctor does take Medicare but does not accept Medicare assignment, then that doctor can charge up to 15% more than the approved amount, and you would be responsible for that. This is usually not a problem for a $300 medical bill, but it can be a problem if you have a $300,000 surgery. This is another potentially large liability that you have with original Medicare without a Medigap or MAPD plan. As far as clinical laboratory services, Medicare Part B usually pays 100%, and it will usually also pay 100% of the approved amount for home health care. For outpatient services, the payment is based on the procedure that you're having done. Lastly, let's talk about blood. You're responsible for the first three pints of blood, and then after that, Medicare will cover 80% of the approved amount and you're responsible for the remaining 20%. Now that we've discussed what your potential costs can be, let's take a look at how you can limit some of those liabilities that you have with original Medicare by itself. Then we can compare Medicare Advantage vs Medigap. On the left, the chart shows the first way you can limit your expenses. You take a stand-alone drug plan even if you do not take any medications. Lastly, in this matrix, you will also purchase a Medicare Supplement insurance plan to fill in those gaps that we just talked about. That's why Medicare Supplement insurance is also called Medigap – because it fills the gap. There is a second way to limit your liability, and the chart shows it on the right. This second way is to trade in your original Medicare Parts A and B for something called Medicare Part C, which is also known as Medicare Advantage. Medicare Advantage is primarily HMO plans, but there are also other types of plans. We are going to focus today on the HMOs because those are the most widely popular Medicare Advantage plans. The rest of this article will give you the difference between Medigap vs advantage. Let's look at the Pros of Medicare Advantage. In order to compare Medicare Advantage vs Medigap, let's start with the PROS of Medicare Advantage. First of all, there's usually no or low additional monthly premium on top of your Part B premium. Keep in mind that The Medicare Part B premium can change each year, and you must pay it in addition to any Medicare Advantage Plan that you enroll in. 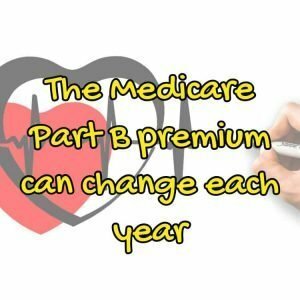 The Part B premium, in 2019 is $135.50 per month if you're new to Medicare. Some people pay less due to the “hold harmless provision”. Regardless of whether you go with Medicare Advantage or Medigap, you must continue to pay your Part B premium. But one difference between Medicare Advantage vs Medigap is that many MAPD plans do not have an additional premium on top of that! 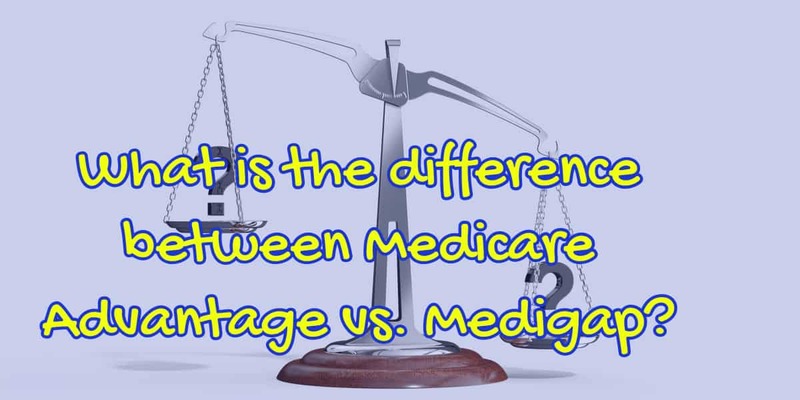 *This is a very important difference between Medicare Advantage vs. Medigap. Another difference between Medicare Advantage vs. Medigap is that with Medicare Advantage if there is a monthly premium, it can actually be taken out of your Social Security check. This is not true with Medigap. It is also very easy to qualify for this type of plan. The only dis-qualifier is end-stage renal disease. If you have end-stage renal disease, then you will not be able to get a traditional Medicare Advantage plan, but there are other plans that you can qualify for. Medicare Advantage is a one-stop shop. You only need to carry one card in your pocket because it's going to carry all of the parts of Medicare. Also, you'll most likely have a primary care physician. Even if you have a PPO, many require that you choose a primary care physician. You must have a primary care physician with an HMOs, and the nice thing about this is that they're going to know about all of your care so that you don't have one doctor canceling out what another doctor is doing. You will have a predictable co-pay for the calendar year. For example, if you have an appointment with your primary care physician, you'll know how much that's going to cost in advance. Additionally, you'll know how much your specialist is going to cost. And you'll also know how much it's going to cost to go to the hospital. This next “pro” is my favorite: the maximum out of pocket for medical expenses. (Keep in mind that it doesn't apply to your medications). But once you hit the maximum out of pocket, you'll have no more medical expenses through the end of the year. Here's another “pro” for Medicare Advantage: Some people are already on a plan at work and they find out that the Medicare plan is available through that insurance company. That's fine to enroll in that company's plan, but please just make sure that you understand how it works. Because most Medicare Advantage plans work a little bit differently, especially for medications, then your work plan does. Also, another popular benefit that many Medicare Advantage plans offer is extra benefits. That is benefits that are not covered by original Medicare. Now, these extra benefits can be transportation, vision, dental, hearing, gym memberships. Some of the plans even allow you to go to a skilled nursing facility without that three-day hospital stay. Now let's take a look at some of the cons of Medicare Advantage. To give a fair comparison of Medicare Advantage vs Medigap lets take a look at the cons of Medicare Advantage. First of all, Medicare Advantage is usually limited to a local network of doctors and you have less choice. Let me give you an example that's pertinent to where I used to live in San Diego. We had a healthcare system called Scripps. There are many different Scripps medical groups and clinics all over San Diego. For example, Scripps Coastal, Scripps Clinic, Scripps Mercy, etc. A lot of people don't realize that your ability to see a specialist is based on the group that your primary care physician is located in. For example, if your primary care physician is at Scripps Coastal and you have a podiatrist at Scripps Clinic, and you have an ophthalmologist at Scripps Mercy, you will probably not be able to see all of those doctors. A lot of people don't realize this. But that might not be true. Your specialists are usually tied to your primary care physician, so it's very important that you understand that. You also need to know even if you're in a Medicare Advantage plan for an extended length of time, you may not be able to go to a Medigap plan because those plans are medically underwritten. 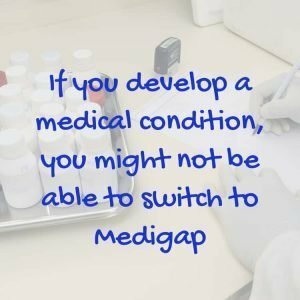 What that means is that if you develop a medical condition, you might not be able to switch to Medigap, which is also known as Medicare Supplement. Also, if you go out of your coverage area, which in San Diego is the County of San Diego, most of these plans do not allow you to see a doctor out of your area. I don't want to say that none of them do, but the majority do not. You're always able to get emergency care in the United States, but let's say you want to see a podiatrist out of your area. You might not be able to do that. Also, the terms can change every year. Everything about the plan can change. Your primary care physician co-pays can change. Everything about your plan can change every single year, and that's why you'll get an annual notice of changes (ANOC). This will tell you what those changes are. And, the insurance company can drop the plan altogether. In 2015, San Diego had three PPOs. In 2016 there was only one. Everyone who had the plans that were dropped had to get a new plan. Additionally, these plans are not standardized. You can have three or four different plans with the same insurance company and they're going to look completely different. This next section about mobile doctors may or may not apply to you. If you're living in a community for seniors such as an independent living, assisted living, or memory care, that's where it could apply. Many times, these communities have doctors that travel to the communities. That's not as important when you're in an independent living community, but when you get to assisted living it becomes more important to be able to see the traveling doctor and the most important when you're in memory care. People in memory care can find it to be very traumatic to leave their homes. Many of these mobile doctors are not in-network for Medicare Advantage plans. If you're in a Medicare Advantage HMO and the mobile doctor is out of network, you will have to pay 100% of the costs to see that doctor. Lastly, your doctor can leave the plan at any time. They do not have to wait until open enrollment. If your doctor leaves of his or her own volition, you will have to find a different doctor that is in-network. Those are the typical pros and cons of Medicare Advantage. What about the other type of plan, Medicare Supplement insurance, which is also known as Medigap? Let's first talk about the pros of Medigap plans. Just as we started with the Pros of MAPD to compare Medicare Advantage vs. Medigap, we'll start with the Pros of Medigap now. This type of plan is very flexible. Unlike Medicare Advantage, Medigap plans are very flexible. This is an important difference between Medicare Advantage vs. Medigap. As long as the doctor accepts Medicare Part B, they must accept your plan. There are no networks with this type of plan. Your coverage is anywhere in the United States. If you live on the West Coast and the top doctor for your condition is on the East Coast, you'll be able to go and see that doctor. Of course, Medicare will not cover your travel expenses and neither will your Supplement plan, but it will cover your medical expenses anywhere in the United States. With Medigap, there's a wide range of plan choices. If you'll take a look at the chart, you'll see what the plans are called and what each plan covers. Keep in mind that this can be a little confusing because these plans are called plans, and the parts of Medicare are called parts, but they're both called a letter name. Plan A, Plan B, Plan C, and Plan D are different from Part A, Part B, Part C, and Part D. Please keep that in mind. These plans are standardized, so a Plan F with one insurance company covers exactly the same thing as a Plan F with another insurance company. Standardization among plans is an important difference between Medicare Advantage vs Medigap. Medicare Supplement Insurance (Medigap) has this but MAPD does not. Medigap plans are guaranteed renewable, and the terms cannot change as long as you pay your premium. Now keep in mind that the insurance company can raise your premium at any time. Medigap offers year-round open enrollment, so as long as you're healthy if you have a plan F with one insurance company and that insurance company raises your rates, you'll be able to go with any other plan with any other insurance company as long as you can pass their medical requirements. So when comparing Medicare Advantage vs Medigap, you need to understand the different enrollment periods for these two plans. Medigap is open enrollment whereas MAPD is only during certain times of the year. Insurance Companies medically underwrite, so you will not able to switch plans if you cannot medically qualify. That being said, California covers you by what's known as the California Birthday Rule. The Birthday Rule says that as long as you change plans to the same plan or a lower benefit level plan within 30 days of your birthday, the insurance company cannot ask you any medical questions and they must issue your policy. In California only, if you want to change plans because the premium increased or the customer service went down, or for whatever reason, you'll be able to do that and the insurance company can't use your medical conditions against you within 30 days after your birthday. But don't cancel your existing coverage until the new plan has been issued!. A difference between Medicare Advantage vs Medigap is that the birthday rule only applies to Medigap, not Medicare Advantage. Lastly, let's look at the cons of Medigap to fairly give a comparison of Medicare Advantage vs. Medigap. What are the negatives of Medigap? First, its always going to cost more than zero because these plans always have a monthly premium. And, you'll have to purchase a separate drug plan even if you don't take any medications. This will be an added monthly expense. Another con is that you can't have the premiums for Medigap plans deducted from your Social Security check. And you'll have to carry three cards in your wallet. Crooks can steal your identity with your Medicare card because of your Social Security number on it (potentially until the year 2020). This will hopefully change with the updated cards. And, the doctors might not talk to each other. Let's take a look at a scenario where I live in San Diego. Those doctors don't talk to each other so it's going to be up to you to make sure that your primary care physician has all of your medical records. This happened with my husband when he had to have eye surgery. He physically picked up and delivered his records to each doctor. (Your records belong to you, but they can charge you for making the copies). And, you might not be able to get one of these plans. Insurance companies “underwrite” these plans. This means that if you have any medical conditions, they can say no. And yes, the Affordable Care Act allows insurance companies to medically underwrite Medigap plans. When comparing Medicare Advantage vs. Medigap, don't wrongfully believe that you can take a Medicare Advantage plan while you're healthy, and then five or six years later, when you get cancer or Parkinson's disease, that you can just switch over to a Medicare Supplement plan, because you might not be able to. Lastly, you will receive more paperwork on a Medicare Supplement Plan. This is because when you see a provider and you have original Medicare with Medigap, your provider is billing Medicare. When you are on the other type of plan, the provider typically gets a monthly payment regardless of whether you need care that month. This extra paperwork can be a hassle for some people. Those are the typical pros and cons of Medigap insurance, which is also known as Medicare Supplement. There you have it. Those are the important things that you need to know about Medicare Advantage vs. Medigap plans. I know, it was a lot of information. The good news is that you can get this information, along with other important information in my free classes. Just go to http://MedicareQuick.com/Class to sign up. The classes are in video format and are free. You can watch the videos in the comfort of your own home.